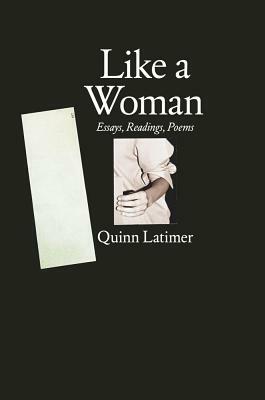 Quinn Latimer's arresting writings find expression in literature and theory as well as contemporary art and its history. Moving from Southern California to central and southern Europe, crossing geographies and genres, her texts record specters and realities of culture, migration, and displacement, compounding the vagaries of rhetoric and poetics with those of personal history and criticism. Composed in the space between the page and live performance, Latimer's recent essays and poems collected here examine issues of genealogy and influence, the poverty and privilege of place, architecture's relationship to language, and feminist economies of writing, reading, and art making. Shifting between written language and live address, between the needs of the internal and the external voice, Like a Woman retrieves the refrain, the litany, and the chorus, exploring their serial ecstasies and political possibilities.